Headlies: WrestleMania 29 Card Updated Post-Royal Rumble - WrestleCrap - The Very Worst of Pro Wrestling! The WrestleMania 29 card has been officially updated after the tremendous Royal Rumble in Phoenix, Arizona on Sunday night. Let’s take a look at how the card shapes up after a superhuman performance by John Cena in winning the Royal Rumble match. It’s shaping up to be quite the card. Can John Cena regain what is rightfully his? Will General Manager John Cena throw any curveballs at John Cena to derail his quest? Only one way to find out! Tune in LIVE on Pay-Per-View! I'm a Paul Heyman guy...I'm just glad he doesn't owe me any money. Skinner once shot a booger over my seat. I was also licked by a Bushwhacker. They reeked of Right Guard. I love me some NBA as well, I'm the founder and editor-in-chief of HoopsHabit.com. Check it out. 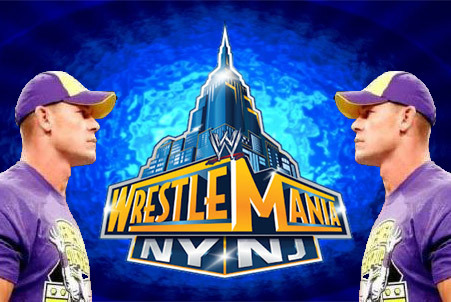 18 Responses to "Headlies: WrestleMania 29 Card Updated Post-Royal Rumble"
That’s crap! It’s the same main event as last year. Someone should do this card on WWE ’13. It’s funny because WWE seems to make you want to think John Cena is the only guy worth watching. A lot of you fellow old school fans may agree with me on this but I feel Punk’s title run was very similar to Randy Savage’s in 88-89. Sure, he had the belt but he still wasn’t the featured guy. Hogan and Cena play the exact same role just in different time periods. Only thing is back then Vince realized when something got stale. Ugh, so predictable. No one can beat John Cena, not even John Cena. And we all know how good John Cena is at ladder matches. John Cena will pull John Cena off the ladder and get the contract to face John Cena at Extreme Rules. This reminds me of that UFC card where Brock Lesner fought Brock Lesner. I get that wrestling fans on the internet are obligated to hate John Cena. Ok, I get it. But this feels more like some random forum post than a wrestlecrap.com entry. Please don’t make this new format feel like a step down from what we’ve come to know and love. 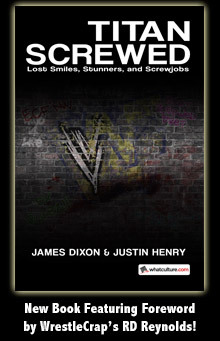 This is THE funniest thing I’ve read so far on the new Wrestlecrap! Thanks Michael! I was really hoping for a Last Cena Standing Match. With commentators John Cena and Michael Cole. It will be epic. 4+ hours of Cena making immature jokes with Cole’s sole contribution being the uproarious laughter he adds after each joke. You forgot the epic, end of an era Hell In A Cell encounter with WWE Champion John Cena vs. WHC John Cena, with John Cena as special guest referee, to unify the titles. Or is that being renamed Cena In A Cell? Don’t forget the dark match; the “30 Cena Battle Royal”. I don’t know. I feel like John Cena should be a bit more prominently featured on that card.